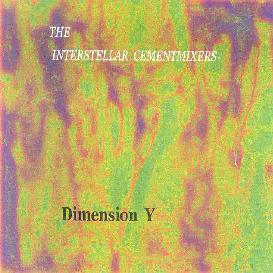 The Interstellar Cementmixers - "Dimension Y"
As with their prior releases, The Interstellar Cement Mixers (Rich Collins and Stephen Martin) voyage again to the far reaches of the known cosmos with Dimension Y, which features eight previously unreleased tracks from the ICM archives. Many have compared the Mixers’ intergalactic sound montages to those of Zeit-era Tangerine Dream and Klaus Schulze’s early space cadet phase (Irrlicht and Cyborg), and it’s easy to see why. Dimension Y is a veritable handbook on the reconstruction of the early 70s Berlin School sound: huge modular drones, interstellar radar bleeps, liquid streams of analog electronics, eerie cosmic choral voicings, oceans of white noise, massive ambient textures, waves of static electricity—truly music for deep space explorers everywhere. More importantly, the ICM sound itself is an invitation to the mysteries of the physical universe as revealed through sound: exploding suns, collapsing stars, the music of the quasars, planets in endless transit, the chemical decomposition of metamorphic worlds, the hazardous navigation of time warps, the remote sensing of alien atmospheres. Nowhere is this more evident than on the masterful “Methane Collision,” 18 minutes of mind-bending cosmic mayhem that features pulsating synthesizers, oscillating noise sweeps and slowly drifting pad textures, all eventually coalescing into a dark, elegiac hymn for the entropic forces of the universe. The same could be said of “Dimension Y,” though the emphasis here seems to be on slowly evolving synth textures that merge and fuse into one another like interstellar dust clouds on their endless migration across distant galaxies. “Underwater Inferno” seethes and roils with all the murky ambience of some impossibly alien sea imploding in upon itself, while the muffled shrieks and hydraulically distorted moans of mutant whales and half-humanoid dolphins reverberate through sunken cathedrals and emerald grottos. “Radar Parchment” is a fitting finale to this interdimensional trek, its twittering filter sweeps and modulated synth backdrop enveloping the listener in a ghostly vortex of disembodied voices and shimmering ectoplasm. Fans of the cosmic era of contemporary German music will definitely want to pick up Dimension Y, as well as the Mixers’ earlier releases. This is as close as you’ll ever get to Alpha Centauri without actually flying there. For more information you can visit the Interstellar Cementmixer's web site at: http://www.interstellarcementmixers.co.uk.